The Sly Cooper series is, in my opinion, one of the most underappreciated games on the Playstation 2. It is by no means unknown, but it deserves so much more attention than it gets. Sly Cooper 2: Band of Thieves, specifically, embodies a little bit of everything I love about video games. Its colorful, the characters are vivid and enjoyable, the music is awesome, it makes you feel cool, it has upgrades, secrets to find, it has a big twist, it’s open world, it has great mini-games, and most important of all, its just fun to play. I have played each game in the series, not including Sly Cooper 4: Thieves in Time, at least 30 times over. Though a lot of the reason I played the Sly games so much was because I didn’t have that many games, I still play the Contessa levels every Halloween season just because I love it so much. Now my level of devotion to this game is obviously a little bit in the extreme but the game is a joy to play. It’s a beautiful mix of platforming and sneaking, awesome mini-games and challenges that make up the missions, a great cel-shaded style that still looks really good today, and witty and fun writing. I think Sly Cooper 2: Band of Thieves’s strongest point is its characters. Everyone is unique and interesting, and the story that drives the whole game is fun and exciting. To me, there is no one in the world, video game world or other, that is cooler than Sly Cooper. His name is Sly for Christ’s sake. 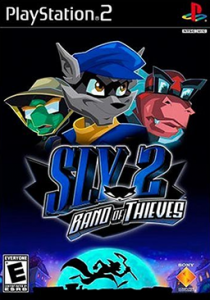 And that is why Sly Cooper 2: Band of Thieves is one of my most favorite games of all time.